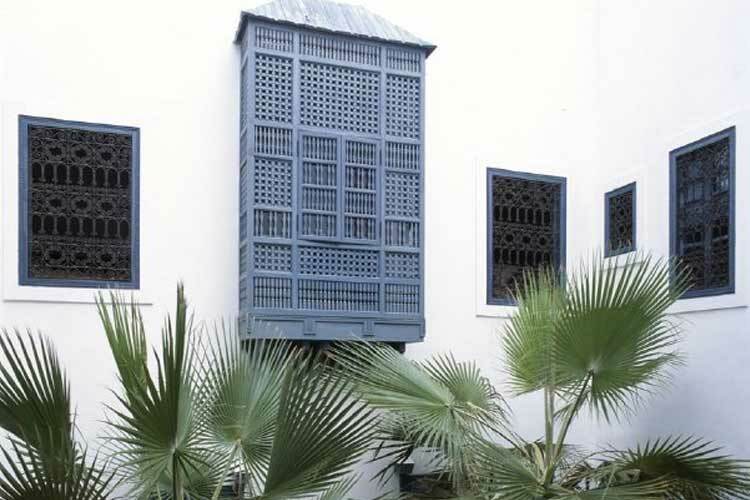 1 Derb Driba Jdida Sidi Ben Slimane, Medina, 40000, Marrakech, Marrakech-Tensift-El Haouz, MOROCCO. 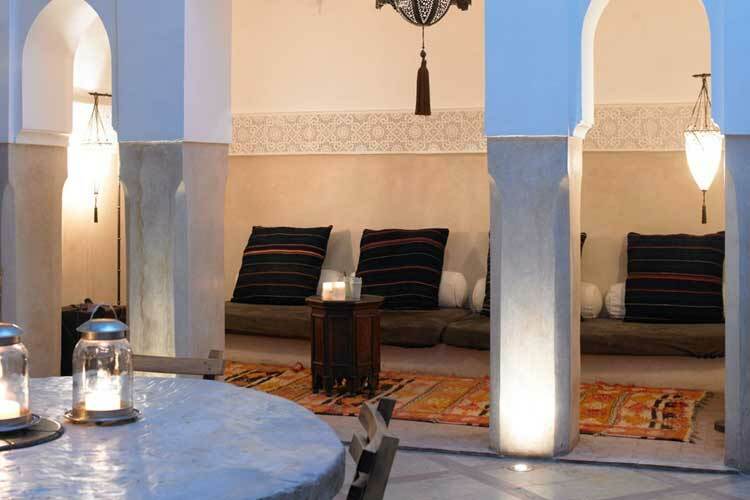 Through the charming street and alleyways of Marrakech's medina is the Ryad Dyor, a beautiful boutique hotel created from the conversion of two traditional Moroccan ryads (interior-facing properties around a central courtyard). 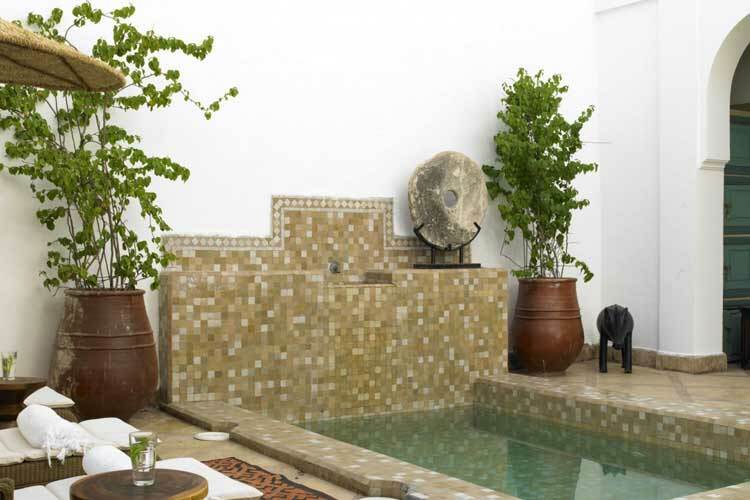 Within the private world of the hotel Ryad Dyor are two courtyards (one with a plunge pool, the other with palm trees and a fountain), 5 suites, 2 rooms, a dining area and several lounges. 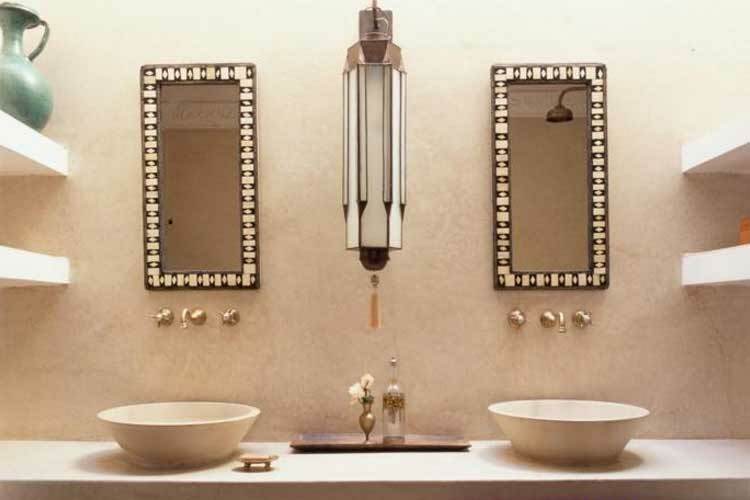 The European owners have successfully blended traditional Moroccan and modern European styles to create subtle interiors with a peaceful atmosphere. 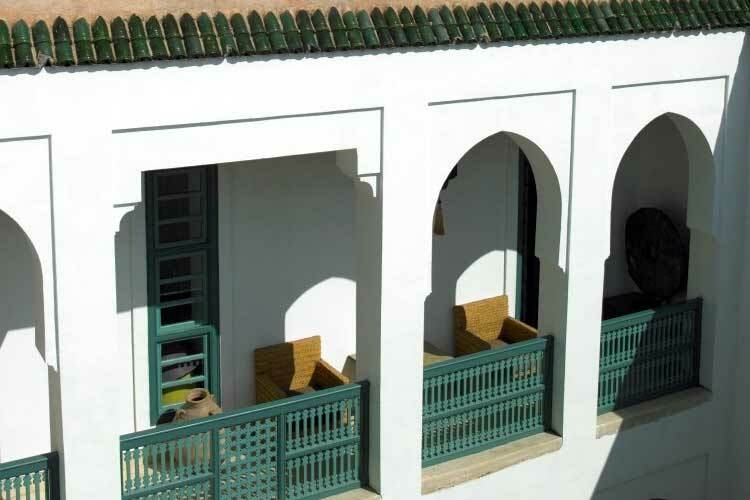 On the top of the two-storey building is a panoramic roof terrace with views over the old city of Marrakech towards the Atlas Mountains: a wonderful place to enjoy breakfast or a mint tea. 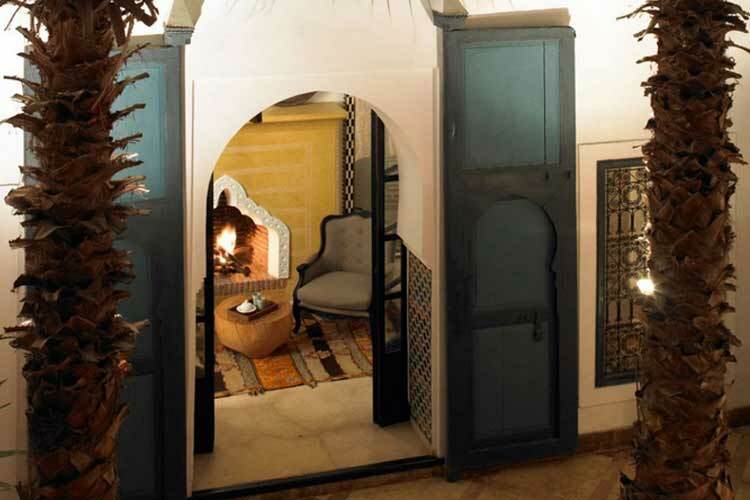 Ryad Dyor is located in the north part of the Medina, at Sidi Ben Sliman, one of the most authentic and traditional areas of the ancient Medina, 20 minutes drive from the airport, 10 minutes drive from the two golf courses, Amelkis and Royal Golf (10km), and 15 minutes walk from Jamaa el Fna Square, the famous square of Marrakech, 5 minutes walking distance to the Souks (market with little shops. 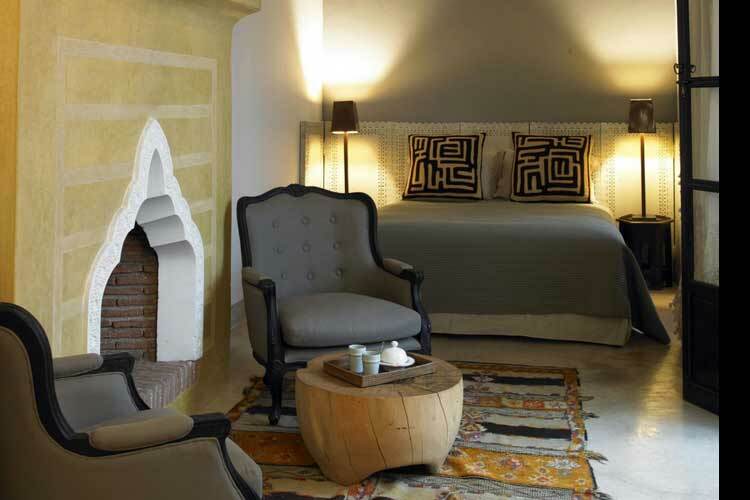 The Ryad Dyor contains seven beautifully appointed places to sleep, 5 suites and 2 rooms. 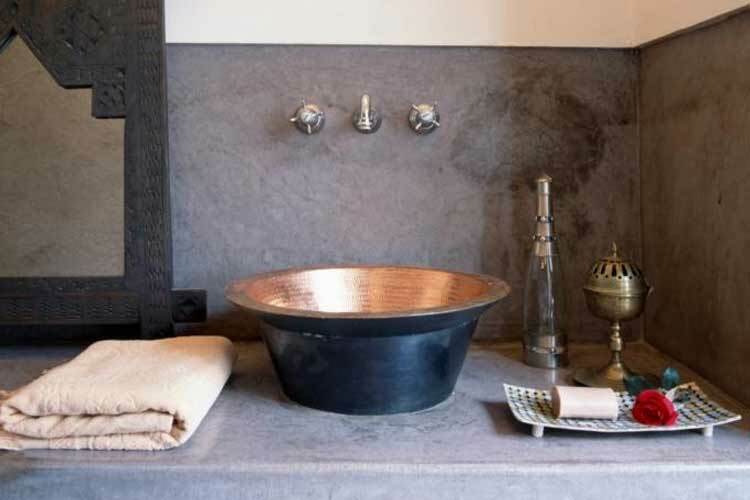 All the rooms have been individually decorated and feature comfortable beds, lounge areas, fireplaces and traditional tadelakt walls in the bathroom. 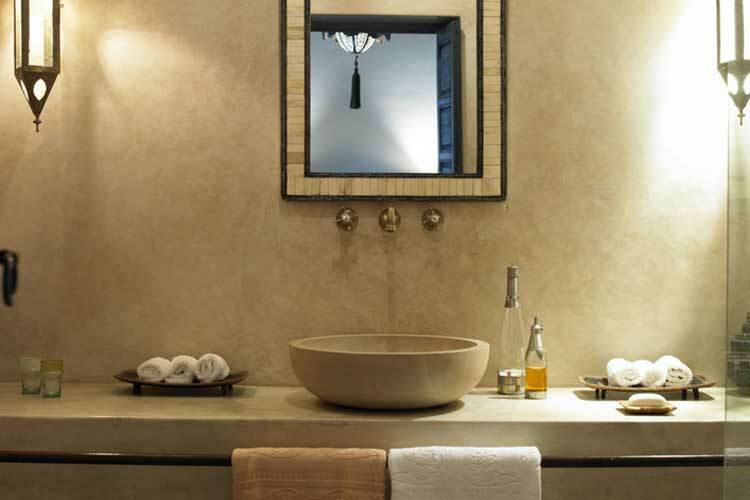 Suite 1: Ground floor suite located opposite the fountain with double bed, a fireplace, lounge chairs and tadelakt bathroom. 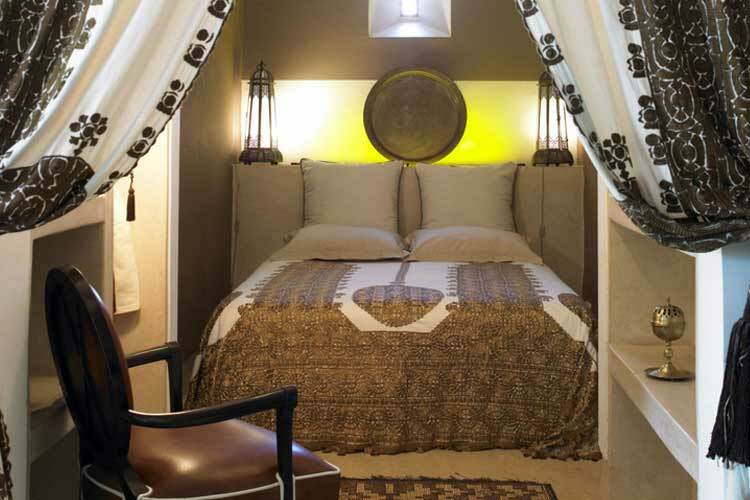 Suite 2: First floor suite overlooking the courtyard with double or twin beds and a spacious bathroom. 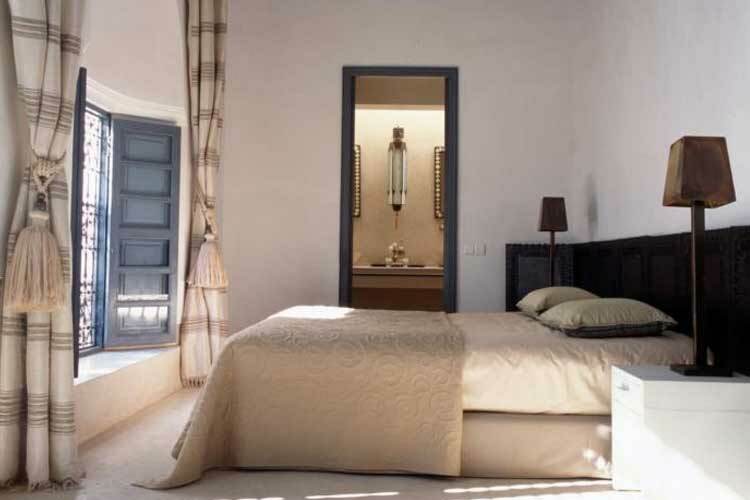 Suite 3: First floor suite close to the roof terrace for 2 or 3 persons with a split-level lounge and sofa bed. 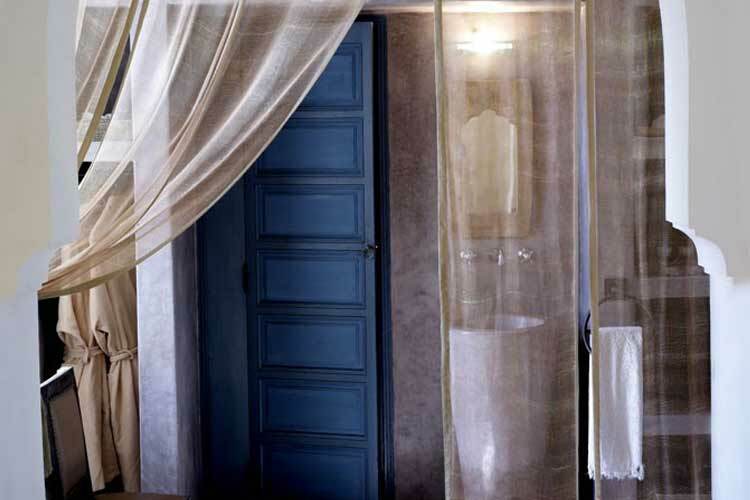 Suite 4: Romantic suite with hand painted ceiling, double bed and bathroom with bath tub for two. 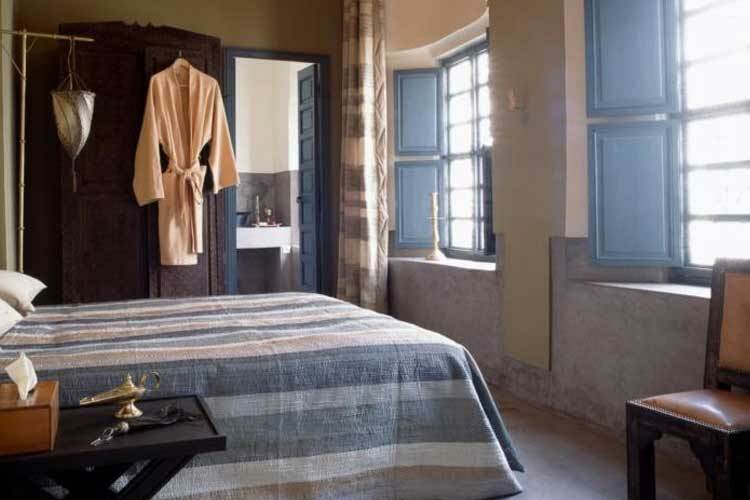 Room 5: Twin room with direct access to the second courtyard and plunge pool, plus a split-level bathroom with shower. 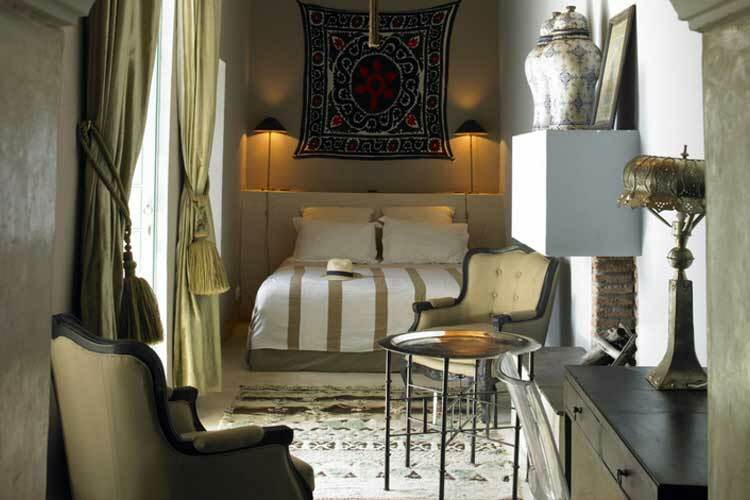 Room 6: First floor room overlooking the courtyard with double bed and tadelakt bathroom. 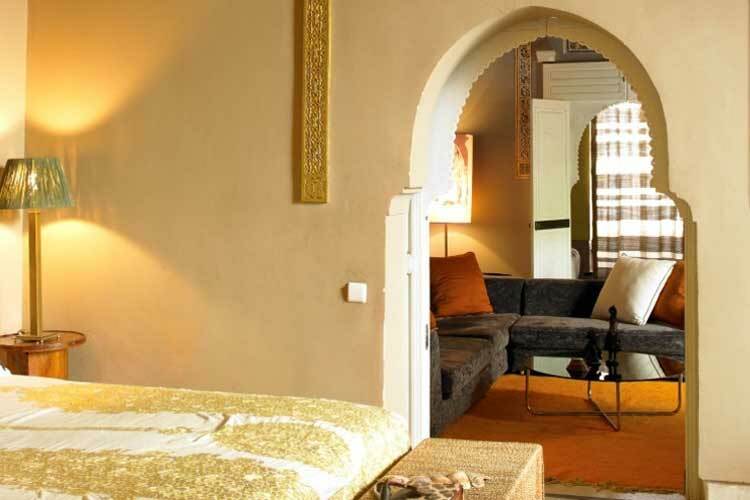 Suite 7: spacious suite for 2 or 3 people with a separate lounge area and overlooks the pool and orange trees. 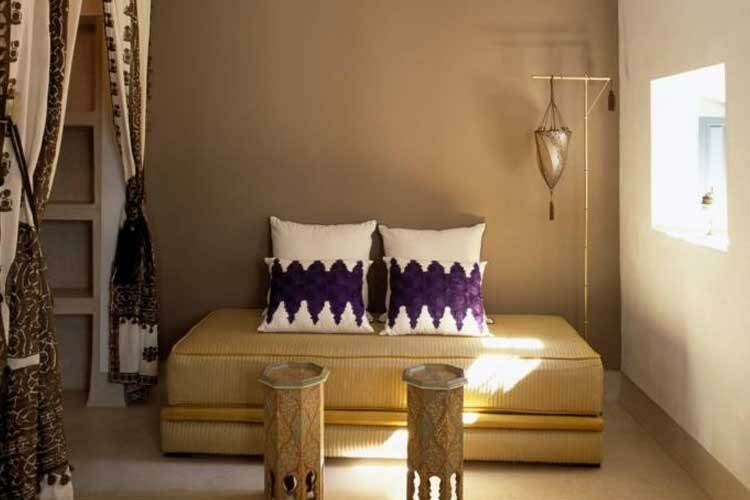 The lounge can be turned into an extra single bedroom. 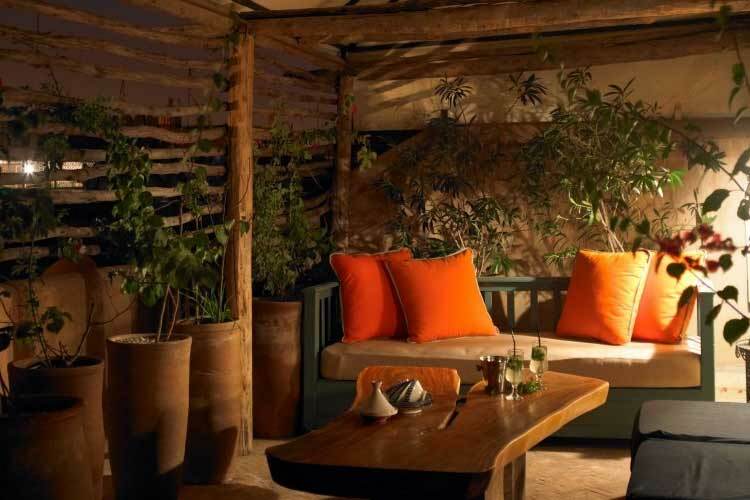 Private roof-top terrace decked with rose bushes. 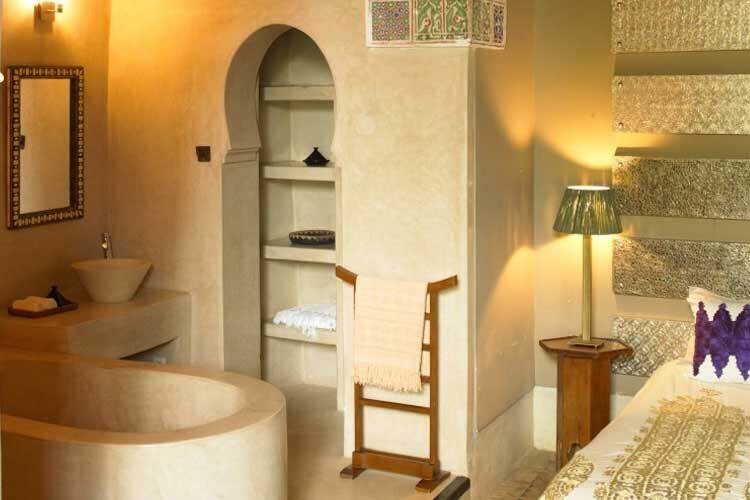 The bathroom with luxurious Morrocan bath tub for two, double wash basins and shower and toilet, has wonderful natural light. 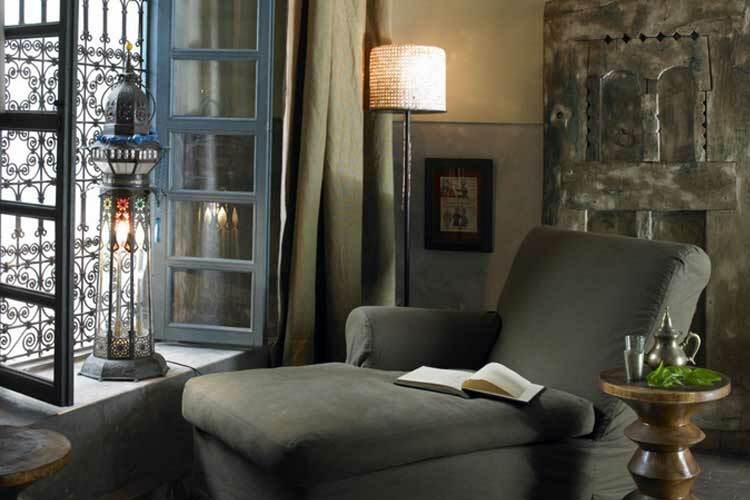 During the winter months, the fireplace creates an atmosphere that feels like home. All suites include: king size beds with pocket-spring mattresses, hot/cold air-conditioning, flatscreen TV with DVD player, DVD collection, iPod station, electronic safe, mini bar, yoga mat, hair dryer, complimentary tea/coffee making facilities, fruit basket, and warm and friendly English-speaking staff on hand to make your stay special! Services and facilities include: front desk manager, airport transfers, welcome drink on arrival, delicious breakfast included, traditional Moroccan cooking, hammam, massages, manicures and pedicures, plunge pool, sun loungers on the roof terrace, exclusive rental of the whole riad, foreign exchange, car and chauffeur service, babysitting/child services, laundry service, and restaurant reservations. Wireless internet is available in the entire hotel and is free of charge. 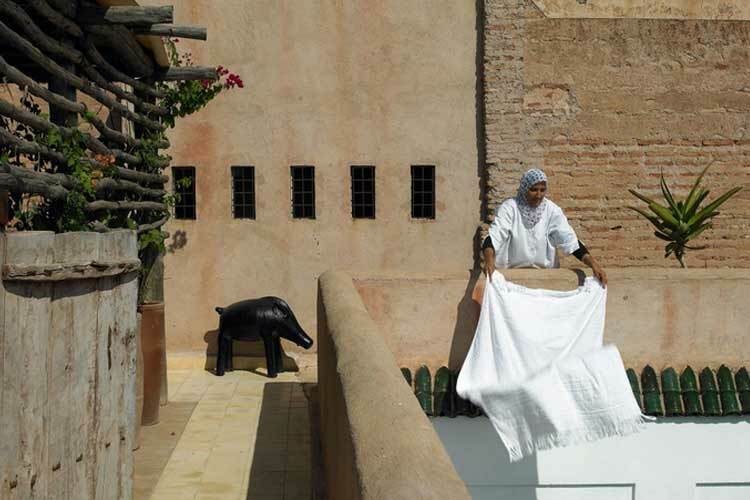 Nearby activities include: golf, guided cultural activities, private shopper, horse/camel riding, and outings to the Atlas Mountains, the desert and the coast. 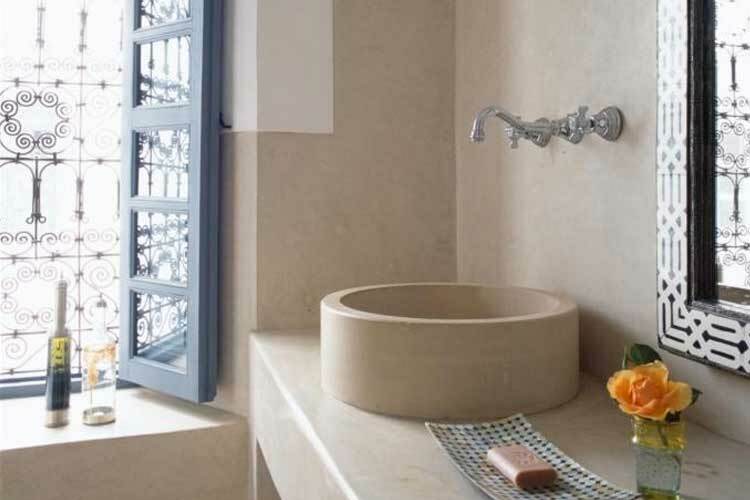 Rates are per room per night and include: breakfast on the roof terrace, complimentary roundtrip airport transfer, automatic upgrade at time of arrival if possible, complimentary tea and coffee throughout the day, complimentary fruit, pastries and mineral water, and local taxes. All costs, prices, and policies, including exchange rates, package deals, and cancellation policy may change and should be confirmed with the hotel upon booking. Year of establishment and/or latest refurbishment: 1700's/2005. Credit cards accepted: Visa, Euro/Mastercard, Carte Bleue, Maestro, Discover, Bankcard. Restaurant closed: Open for breakfast only. Nearest airport: Menara (RAK) - 4.7 km.